Premium Split System Clean and Sanitise. This is our most popular and thorough clean, which we have been providing for over 10 years. Our premium clean is recommended annually for Asthma and Allergy sufferers of for any customer who has not had their air conditioner professionally cleaned within a 3 Year period. Sanitair’s premium split system clean takes approximately 60-90 minutes to perform and will restore your air conditioners working capacity to like new. A licenced Sanitair™ HVAC Hygienist will travel to your home or business. All Sanitair technicians are professionally trained, insured and police checked. Our technicians are courteous, respectful and will leave no mess. Removes grease build-up and biological contaminants. Correct cleaning with a non-toxic & environmentally friendly cleaning solution will ensure your system will be free of biological contaminants including Mould, Bio-Films and other harmful pathogens. Correct cleaning not only removes biological contaminant but is good insurance against unwanted system leaks that can damage property. The final part of a Sanitair Premium Clean is the application of Protectair™ BCP. This protective treatment will ensure that your evaporator coils are Mould Free for 12 Months and that is our Guarantee. This proprietary formula also has a deodorising effect and increases operational efficiency, saving you further. 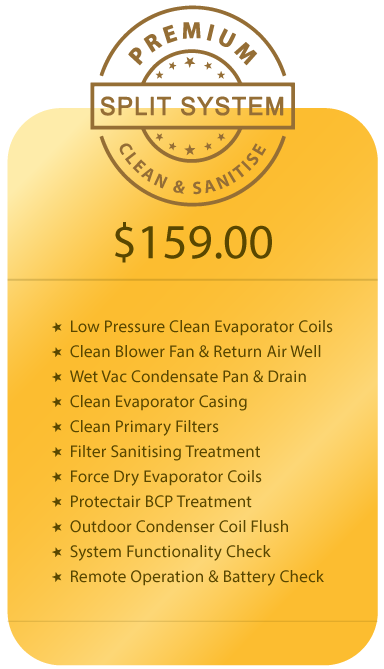 Contact your local Sanitair HVAC Hygienist on Free call 1800 130 168 to find out more about the Sanitair Premium Aircon Clean and Sanitise. 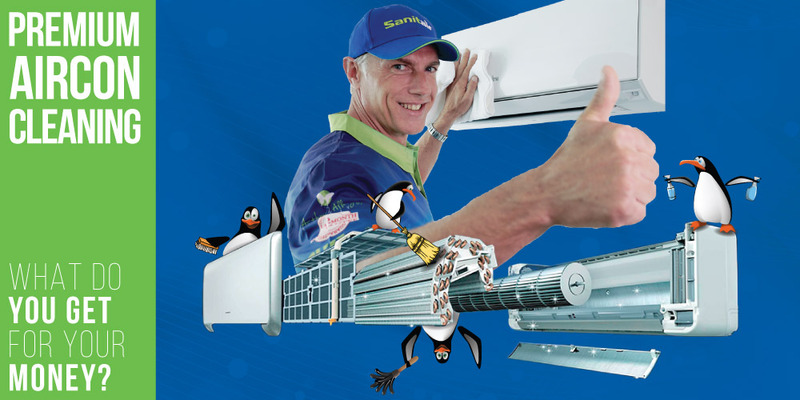 Please Note: Whilst many Sanitair technicians hold trade qualifications in air conditioning, refrigeration and electrical, Sanitair Australia’s core business is HVAC Hygiene. Our technicians do not conduct installation work, mechanical servicing and/or repairs to air conditioning systems. If you are experiencing issues other than a dirty or bad smelling air conditioner your local Sanitair technician can happily recommend a local qualified Sanitair partner that they work closely with in your local community. Please contact Sanitair Head Office 1800 130 168 ext:0 if you would like the contact number of a qualified and trade licensed installer or repairer.